2017 is the first time a Seattle team has won Club Nationals in a decade. This was in no small part due to Mark Burton. Mixtape has always had confident throwers, but Burton proved to be a menace with the disc this season. 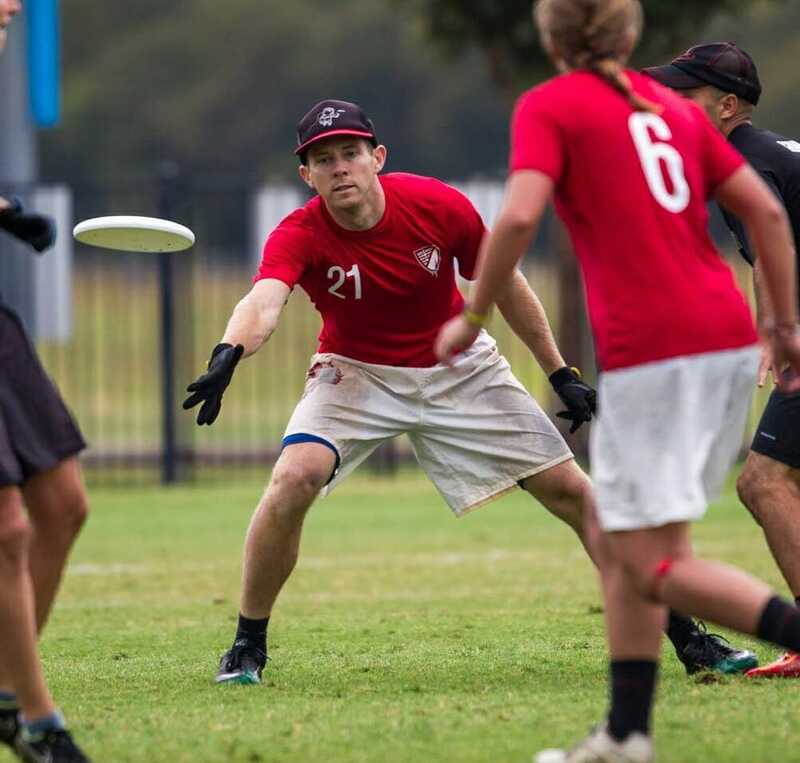 Returning to Mixtape after a few years playing in the Men’s Division, Burton brought a control and poise that the young squad needed. 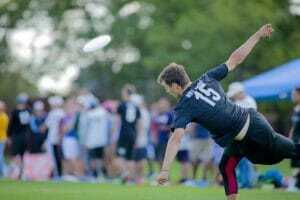 Despite always seeming on the cusp of releasing a full field huck, Burton played surprisingly conservative with the disc. As Mixtape’s central handler, he was more often rewarding the hard work of his teammates than taking risks when given the chance. It paid off. Mixtape has a title. Still, the style from his earlier seasons with the team remained and it highlighted his best strengths. Burton matches Mixtape’s aggressive offense perfectly. Dramatic hucks to streaking receivers and sharp handler cuts kept Mixtape from stagnating on offense. Frequently, it was Burton who could spark play when Seattle seemed stuck. His four assists in the final and six assists in the semis showed that two of the best defenses on the East Coast could not contain him. Burton’s transition from a cutter to a handler opened up flexibility on Mixtape’s O-line. They’ve always had incredibly athletic cutters; in Burton, they found a handler who knew the throws his cutters wanted. His blend of explosiveness and discipline are the tools that Mixtape has molded into their identity. Everyone is expected to make incredible plays. Burton obliged nonstop this season. What else can we say about Anna Thompson? In her first year on Philadelphia AMP, Thompson showed poise beyond her years from the outset, showing off great speed out of the stack to help initiate the AMP offense. A key component of the AMP youth movement, Thompson was trusted in high-pressure situations from the outset, exhibiting incredible throwing ability and some of the surest hands in the division. Highlight reel catches and layouts are the norm from Thompson, who was a focal point of one of the most efficient and balanced offenses in the Mixed Division. On any given point, you can see Thompson open underneath with yards on her defender, striking deep to stretch defenses to the breaking point, and always putting the disc in places where only her teammates can catch them. Seemingly never phased by tight, physical defenders, her vision on the field and calm throws mean the AMP offense always has an escape from sideline traps. Combine all this with picture-perfect layout form and defensive timing, and you have a player to build a program around. 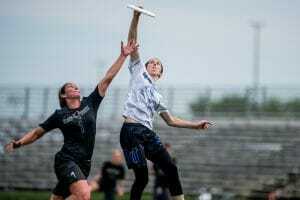 Trusted in double game point situations and relied on to get the disc back on defense, Thompson is a star on the rise in the division, and this early in her career, she can keep AMP in contention for a national championship for years to come. After his breakout performance in 2016, there was every possibility that the shine could wear off for Johnson in 2017. Instead, Slow White’s reliance on the 20-year-old grew as he became their offensive focal point. Tannor’s role on the team ramped up after the roster turnover from 2016, but he did not lose a step with the added responsibility. It’s safe to say he rose to the challenge. Johnson dominated the stat sheet for Slow White. His production rate showed the increased reliance that Boston placed in their young cutter. He was the only Boston player with double-digit goals in Sarasota and tied for third in assists at Nationals. This happened all season for Johnson: he was Boston’s top goal scorer, second in blocks, and third in assists. With his attacking style of offense, Johnson proved to be a problem for every team that faced Slow White. Within a few points, it would be apparent that Johnson could run roughshod all over the field — no amount of defensive pressure was able to deter his ability to get open downfield. On defense, he frequently took the toughest matchups, limiting opponents’ top cutting options with an impressive field sense and endless motor. The heavy usage never slowed him down on either side of the disc. Johnson’s presence on both the O and D-lines of Slow White show that they’re ready to build around a player being touted as a prodigy in mixed ultimate. He already has all the tools of an elite player, one whose skill transcends divisions, but his youth means that we probably haven’t seen his ceiling yet. This season, Sarah Meckstroth stepped up when Drag’n Thrust needed her the most, stepping into the gap left by Sarah Anciaux and taking on any role thrown at her. Minneapolis found themselves lacking some of the depth they used to rely on in previous seasons, and it was Meckstroth who took on the burden of lifting the team. Previously known for her defense and aerial ability, Meckstroth moved over to offense this season and truly became an all-around threat on the field. One of the toughest players to guard in the end zone, Meckstroth racked up 31 goals and 18 assists over the course of the season, becoming the lynchpin for a Drag’n offense that missed key contributors throughout the year. Her cuts were always on point, keeping the Minneapolis offense moving and offering the release valve every elite offense needs to have. Beyond just racking up points, Meckstroth was instrumental in earning the disc back after a turnover. 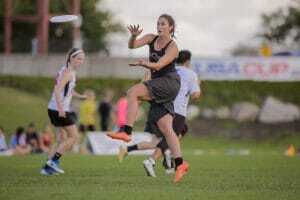 She has impeccable field awareness, getting in position to earn blocks and force opposing offenses into tiny windows to help her teammates win back the disc. Down the stretch in Sarasota, Drag’n had Meckstroth on the field for as many points as she could handle, taking on the toughest female deep threats on defense and initiating the offense out of the stack. Her size and anticipation on defense allow her to challenge throwing lanes and recover on her mark to completely disrupt an offense’s timing. Her speed and timing on offense makes her one of the most dangerous cutters in the mixed division. Her reliability during an inconsistent Drag’n Thrust season earns her a spot the All-Club 1st Team. Evan Klein has been on the national scene for several years, breaking in with Missoula Mental Toss Flycoons, but he really came into his own after joining Mixtape. Right from the start of the season, Klein was one of the most consistent players on a team known for its high-variance style. One of the faster defenders in the country, Klein took on some of the toughest opposing cutters for Mixtape, allowing the team’s other defenders to actively seek out blocks. Knowing they had a defensive rock to rely on, Mixtape’s defense could be aggressive around the field, and that level of pressure pushed the Seattle team to their first mixed championship. Klein is a complete defender. Not only does he bring the athleticism to stay with any cutter in the division, Klein also brings strong aerial skill to challenge any deep threat from opposing offenses. His sense of timing on defense is impeccable, having an innate sense of when to peel off and poach a throwing lane, when to leave his player and help deep, and when to call out switches to keep Mixtape in position. Full field awareness is a skill few players can bring to bear and it adds a layer of complexity to an offensive game plan. Klein forces Seattle’s opponents to account for where he is at all times. Finally, Klein brings great speed, calm throwing, and well-timed cutting on a turn. Able to grind on defense and then run his mark into the ground on offense, Klein showed off his deep speed throughout Nationals. His full-field rundown of a Khalif El-Salaam 90-yard backhand kept Mixtape in the game against AMP, and his incredible consistency throughout the year gave Seattle one of the best defenses in the country. One of the only women in mixed to routinely pick up a dead disc after a turn, Normile proved this season that she was the marshall of the AMP D-line offense. She showed no hesitance despite the responsibility and didn’t settle for the ‘safe’ pass. She posted two assists in both the semifinals and final games, including a cross-field high-release IO flick that few players in the division have in their arsenal. Her fountain of brilliant throws is complemented by her tactical cutting, never wasting movement with unnecessary jukes. Despite playing primarily on the D-line, Normile was fourth in assists for AMP in Sarasota. Considering the incredible performance of the AMP D-line this year, this shouldn’t be surprising. It’s tough to imagine why a player so dangerous around the disc would play primarily on D, but while the stats don’t show it, it only takes a few moments of watching Normile on defense to understand the role she’s been given. Her quickness comes with an field awareness unusual for someone her age, allowing her to dart effortlessly from one throwing lane to another and still prevent her own mark from throwing anything dangerous. She played a role in forcing numerous turnovers without actually touching the disc, whether by causing miscommunication between opponents or by forcing high stall bailouts with lockdown reset defense. The only returning All-Club 1st team player from 2016, Slow White’s Lexi Zalk remains because her talent hasn’t lost a step even as her role grew. Throughout the season, Boston showed their confidence in their star cutter by allowing her huge swaths of the field to run circles around her defender. Zalk hasn’t deviated much from the same gameplan that earned her a spot on the 1st team last year. She plays with a focus on beating her individual match-up to the disc. Every play is contestable, and Zalk’s determination is rewarded more often than not. Her physicality and athleticism allow her to continue winning contested hucks, outrunning overmatched defenders, and landing at the top of the scoring column at nearly every tournament she plays. 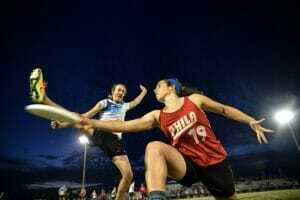 Despite being a ‘high profile’ player in the mixed division, she still posted 22 goals this season and made very few execution errors with the disc in hand. She’s a sure threat downfield and knows how to play her role efficiently in Boston’s clinical offense. 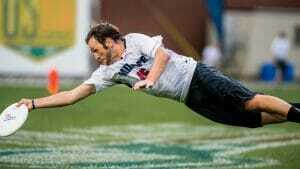 Comments on "Ultiworld’s All-Club 2017: 1st Team (Mixed), Presented By Universe Point"